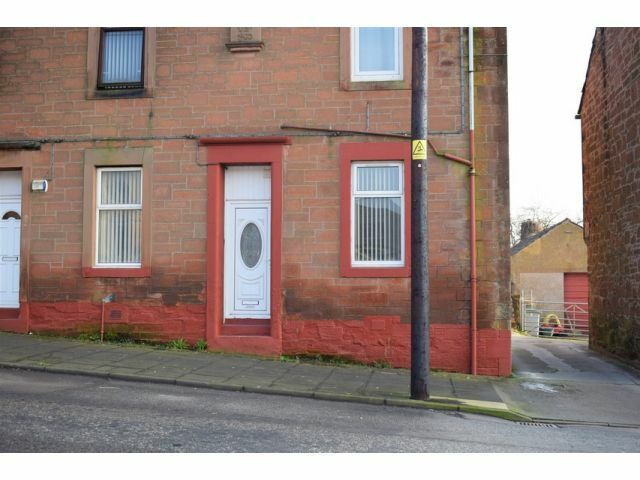 Ideal for a First Time Buyer or Buy to Let Investor! Lockerbie has all amenities associated with a large town including Primary & Secondary Schooling, GP Surgery, a Supermarket and has good rail links to the North & South. Providing a generous Lounge, Kitchen, Bedroom, Shower Room and Additional WC. Benefits from Double Glazing and Electric Heating. Ceiling light, carpeted flooring. Door into Bedroom. Window to side with curtain pole and blinds. Coving, ceiling light, smoke alarm, telephone point. Two storage cupboards (one housing water tank). Gas living flame wall mounted remote control fire. Electric radiator, carpeted flooring. Window to rear with blinds. Ceiling light, smoke alarm. Range of wall and base cabinets, tiled splashback. Integral oven and four ring electric hob, cooker hood extractor fan. Stainless steel sink and drainer with mixer tap, plumbing for washing machine. Space for under counter fridge/freezer. Electric wall heater. Wood effect vinyl flooring. Recessed lighting, extractor fan. Electric wall heater. Full Perspex boarding. Toilet, wash hand basin and walk in shower cubicle with electric shower. Tiled flooring. On street parking. Access at front and rear and small garden area by way of shared footpath. Mains water, electricity, mains gas (fire in Lounge) and mains drainage. Offers in the region of £39,000 are invited and should be submitted to lj Residential, 93 High Street, Annan, DG12 6DJ or by fax to: 01461 205037. ON A MORTGAGE OR OTHER LOANS SECURED ON IT.